Diane at the Patio Theater, before the wedding. 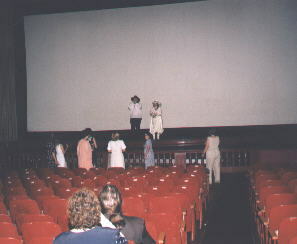 The Bridesmaids (Lee Troutman, Monica Leveck, Laurie Schweinsberg, and Amanda Trower), and the Bridesman (Bruce Farr) decorated the Theater for the reception before meeting Bob and the Groomsmen at Our Lady of Victory for the posed pictures and ceremony. 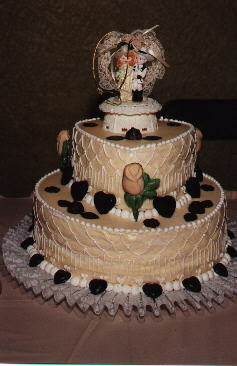 Our wedding cake - angel food with apricot filling and fondant frosting with chocolate hearts. And yes, the groom has a beard! 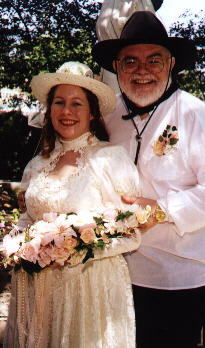 Diane arrives at the church and is met by Bob. Diane and Bob posing in Mary's Grotto outside Our Lady of Victory, just before the ceremony. All of the wedding party left to right: Amanda Trower, Laurie Schweinsberg, Monica Leveck, Bruce Farr, Lee Troutman, Susie Schweinsberg (flower girl), Diane (bride), Bob (groom), Sumner Schweinsberg (our Hobbit ring bearer), Dennis Blackwood, Larry Beuret, Bob Pirmantegen, and Tom Leveck posing in Mary's Grotto next to Our Lady of Victory Church. 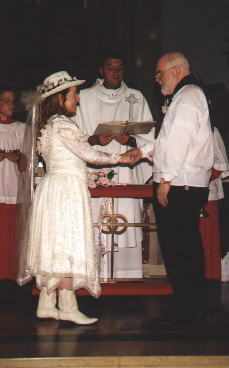 Exchanging vows at the church with Father Gary presiding. 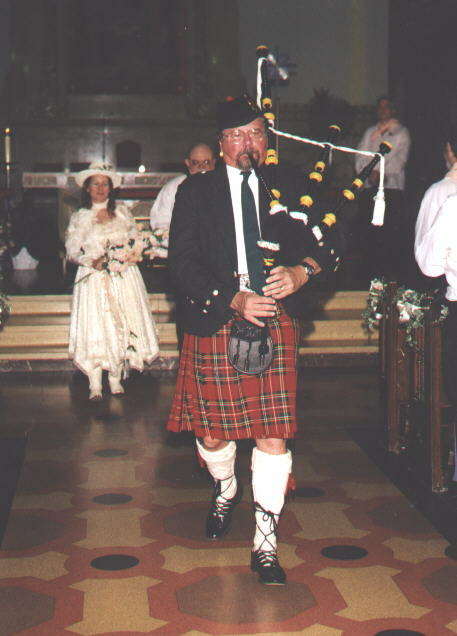 Art Skwerski pipes us down the aisle after the wedding ceremony. Western wear, and a Scottish piper? We're eclectic. 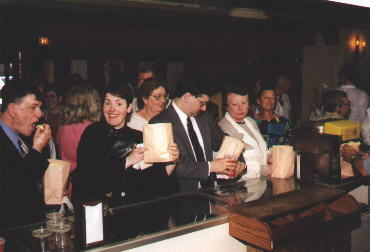 Our guests get their popcorn before the movie starts. 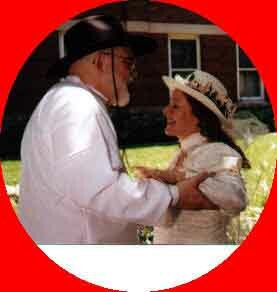 We rented the movie, High Noon, in thirty-five millimeter format, from Kit Carson Films, to show for our reception. Since Bob does movie reviews for the Near North News, we felt this was the way we wanted to celebrate our marriage and share an enjoyable time with our friends. Bob and Diane on stage before the movie is shown, thanking our friends for coming and throwing the bouquet (caught by Carol Thompson). We had a wonderful time with our friends and a lovely honeymoon in Ireland. To see pictures of Ireland, return to our home page with the button below and then use the index to go to the section on Ireland.